Ruff Beginnings Rehab Dog Training and Rescue is a Los Angeles based organization founded by Bethany Wilson. 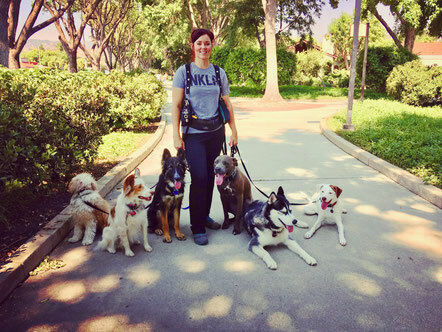 Whether you are struggling with a new puppy or a fearful or aggressive dog, our balanced training techniques will provide you with the guidance and tools needed to be successful. Training with structure and the right tools, our clients get to live the life they want with their dog. This is real world training where we train family dogs by preventing bad behavior, reward good and set up our clients to do the same. Our dog trainers provide clients with guidance, homework, schedules and a level of aftercare that other companies do not. That is why we believe we are successful. We strive to develop a close relationship with our clients. We are available to you to help guide you through situations and remind you of those techniques when needed! We teach you how to communicate with your dog so he will prioritize his decisions and become more aware of better choices. Rather then just being an obedience trainer, we use traditional obedience commands to really help over haul your dogs state of mind to help him make better decisions in real life scenarios. By teaching more about everyday dog behaviors, how to control your dog in uncontrollable situations, we bridge the gap between just obeying a command and having a calmer disposition. We use a variety of tools depending on the behavioral issues of the dog. It is what allows us to help you build the relationship you have always wanted with your dog. Learn more about our methods by watching the videos and check out our social media pages. Following our social media through facebook, instagram, youtube and our blog will help you decide if we are the right fit for you. We want you to be excited to work with us and provide the expert advice you have been looking for.